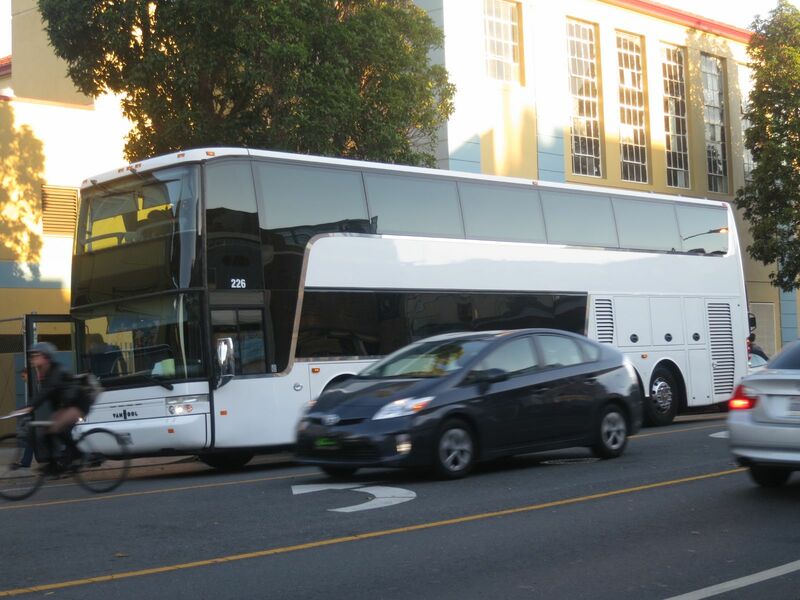 A tech bus rides down Valencia Street. Photo by Lydia Chávez. Valley Wag reports on a leaked memo that tells Google employees what to think about the buses. READ THE FULL STORY HERE in TECH CRUNCH. PreviousSNAP: Fetch Me My Martini! Doesn’t anyone at Google even know correct grammar? Fran, would you have said “my colleagues and me”? That would be wrong, since the phrase identifies the subject of the sentence, and not the object. John. The subject of the sentence is shuttle. The verb is empowers. The object of the verb is colleagues and me. Just as the sentence, “The shuttle empowers me,” is correct, the sentence, “My shuttle empowers me,” is also correct. Finally, “my shuttle empowers us,” is correct. The Google talking point is not correct as written. Gramm, that overlooks the fact that it’s a compound sentence, and therefore has two subjects and two objects or predicates (since neither verbal phrase is intransitive”). The shuttle empowers X, where X is the sentence that “my colleagues and I reduce emissions by removing cars from the road”. In that second statement, X is the subject and “reduce emissions by removing cars from the road” is the predicate. And before you add a further nitpick, it could be argued that it’s really three sentences i.e. 1) The shuttle empowers X. 3) Emissions are reduced by removing cars. Gramm is right; John is wrong. Simplify the sentence to “My shuttle empowers us (or we) to reduce our carbon emissions by removing cars from the road.” to make the sentence structure more clear. As Gramm wrote, my colleagues and me is the object, not the subject, of the sentence. My shuttle empowers we to reduce… sounds nonsensical because it is so grammatically incorrect that our brains trained in the proper use of English reject it. Perhaps Noam Chomsky can chime in–Is The Man Who Is Tall Happy? or Is The Man Who Tall Is Happy? John, Please reference logic and grammar. It is not a compound sentence. Please look up the definition. There is only one subject and one object. Analyzing the sentence: Subject, Verb, Object, modified by infinitive and adverbial phrases. Your response does give me certain insight. Bye-bye John. We can agree to disagree on what is in any event a trivial point. I think either phrasing is fine. The more important point is that these talking points have shown us that there really isn’t a problem with these shuttles, and that their riders are engaged, committed city residents who contribute a lot. Moreover there are powerful environmental benefits from people taking buses rather than cars. With the advent of a deal with SFMTA, this topic is now done. Have you ever been wrong or admitted an error, especially one as obvious as this one? I’ve admitted being wrong as many times as you have. Ron Conway and tech money own SF now. I get a something-like $300 ticket for simply stopping in a muni bus zone. And I work for muni; I drive a taxi.